One word: Amazing. 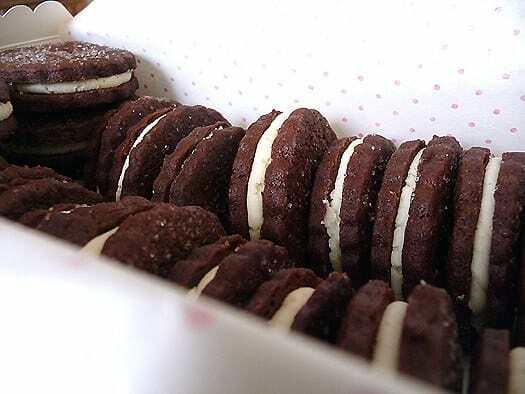 If you have any affinity for Oreo cookies at all, you will happily devour these without looking back. 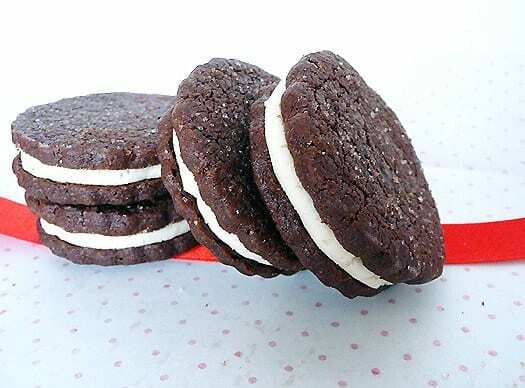 Two chocolate wafer cookies that sandwich a vanilla cream between them – if you close your eyes you may not even notice that they didn’t come out of a blue package. Well, that’s not entirely true. They are better because they’re homemade, of course. The familiar chocolate wafer packs an insane amount of richness and a perfectly balanced flavor, thanks to the use of Dutch-processed cocoa powder. And the vanilla cream in the middle? The texture is perfect and you can easily twist these apart just like you did when you were a kid. 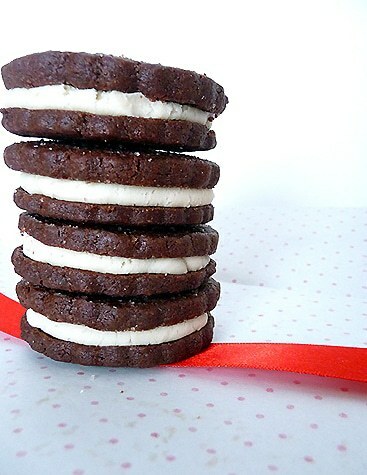 Whether you lick off the cream the middle, eat one side at a time, or dunk the whole thing in milk, one thing is certain: you will absolutely enjoy eating these. You’ll feel like a kid again, all while enjoying a grown-up, non-processed version of a favorite cookie. The original recipe for these cookies includes a white chocolate ganache filling for the middle, but I just wasn’t feeling it. I wanted more of a replica of the nostalgic cookies, and I didn’t think that a ganache filling would fit the bill. Instead, I put together a simple vanilla buttercream with a slightly stiff consistency to make the filling more along the lines of what you would find in the middle of those oh-so-addicting cookies. It turned out perfect and I can imagine these will be cookies that I’ll be making again and again. My grandfather has always been a huge fan of Oreos (remember when I made him the Oreo birthday cake? ), so I can’t wait for him to try one and see what he thinks. I am submitting this recipe to the first roundup of Gourmet, unbound, which is a collaborative project celebrating Gourmet Magazine’s 68 years of publication. Each month, participating bloggers will cook, adapt and write about a Gourmet recipe from that month’s issue of any year of the magazine. 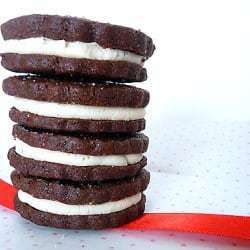 For this first December roundup, I made these chocolate sandwich cookies, which were adapted from a recipe that was originally featured in the December 2007 issue. Reminder: You still have a couple of days left to enter the giveaway for the set of Crofter’s Superfruit Spreads. Head on over to the Empire Cookies post to get the details on how to enter. 1. Whisk together the flour, cocoa powder, baking powder and salt. 2. Beat butter and sugar with an electric mixer until pale and fluffy, then beat in yolk and vanilla. At low speed, mix in flour mixture in 3 batches just until a dough forms. Divide dough in half and form each piece into a 6-inch square, then chill, wrapped in plastic wrap, until firm, 2 to 3 hours. 3. Preheat oven to 350 degrees F. Grease two baking sheets or line with parchment paper or a silicone baking mat. 4. Roll out 1 piece of dough between sheets of parchment paper into a 14x10-inch rectangle (1/8-inch thick). Slide dough in parchment onto a tray and freeze until dough is firm, about 10 minutes. Repeat with remaining dough. 6. Sprinkle half of cookies with decorative sugar (if using), then bake cookies until baked through and slightly puffed, 10 to 12 minutes. Cool on sheet on rack for 5 minutes, then transfer to rack to cool completely (cookies will crisp as they cool). 7. Make more cookies with remaining dough and scraps (re-roll only once). 8. To make the filling, beat the butter and shortening together at medium speed until combined and smooth. Reduce the speed to low and gradually beat in the sugar and vanilla. Increase the speed to high and beat for 2 to 3 minutes until the filling is light and fluffy. 9. 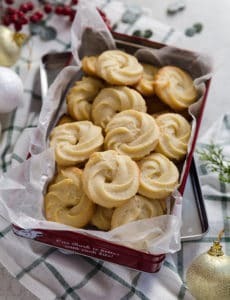 To assemble the cookies, pipe a heaping teaspoon of filling onto the flat side of the plain cookies. Top with the sugared cookies to make sandwiches. Store in an airtight container at room temperature. How long can the dough be stored in the freezer? Hi Lindsay, I would say up to 1 month. Loved this recipe! I made them for a holiday cookie exchange. Although I made peppermint filling with extract and crushed peppermint candies, and then dipped half the cookie into dark chocolate. Decadent! This recipe is so amazing, I think is necessarily detailed and the fact that you changed the filling to something more economic and accessible is cool too. I have a batch cooking in the oven right now! I also wanted to say that the dough can also be rolled into a log and then refrigerated, then just slice off the 1/8 in circles. Not as pretty as the fluted edges, but does speed up the process, and worked well when sub-ing in GF flour that doesn’t roll out as well. I also then just keep the dough log and frosting in the fridge/freezer and slice off a few as needed. Thanks again! How do these keep? I’m planning to ship them across the country. Hi Rachel, They keep really well at room temperature. I would say they’re good for up to a week or so. You should be fine shipping them. I made these as part of a huge batch of christmas baking that I share to friends and family…except…these were so good that I refused to share any.